Because video games were once such an upstart medium — and because the medium rose to prominence before the Internet did — much of the history of how we got here has simply been lost. In a lot of cases, information must be dug up retroactively (not unlike a particular pile of Atari 2600 games). 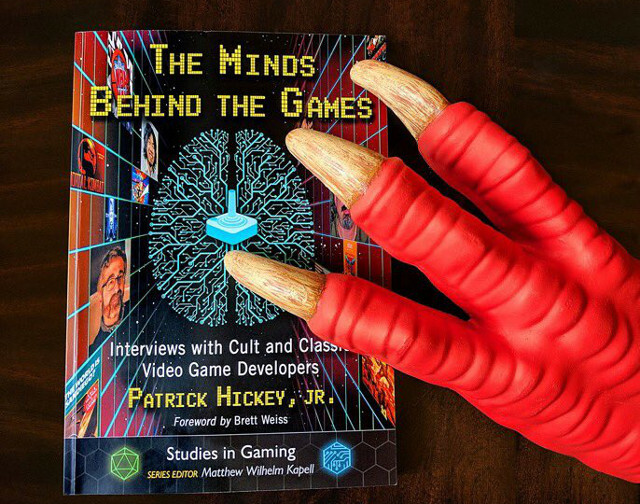 And that’s the point of The Minds Behind The Games: Interviews with Cult and Classic Video Game Developers by Patrick Hickey, Jr. — it digs up, dusts off, and puts on display a tiny sampling of the could-have-been-forgotten stories about game development. The Minds Behind the Games contains interviews with the developers of 36 video games that span several decades. In it, there’s a wealth of knowledge about the journey of video game development, detailed by the people who made it all happen. While there are modern-ish titles mentioned in the book, it spends much of its time dabbling in retro gaming. Obviously, as the owner of a site dedicated to retro video games, I’m very interested in this particular topic. Across this book’s 200-plus pages, we get to read Mike Skupa reminisce about how the intensity of Bully‘s development was taking a psychological toll on him and the whole team. We get to watch an ambitious Streets of Rage follow-up transform into the cult classic Fighting Force. We get to peer inside the heads of NHLPA ’93 developers who are given the challenge of assigning video game stats to real-world human beings — human beings who might not be happy if those stats are unflattering. A chapter on how the five-week development window caused the colossal failure that was E.T. the Extra-Terrestrial is immediately followed by a chapter on how the six-week development cycle of A Boy and His Blob created something truly special (something that almost didn’t ship on time due to a last-minute change that had the potential to break the whole thing). Pitfall creator David Crane (left) and the man behind E.T. 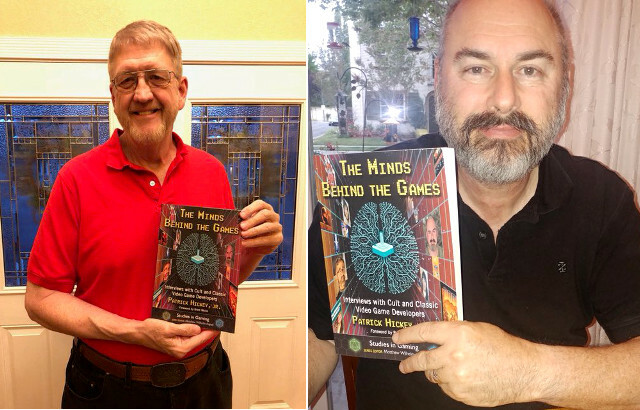 The Extra-Terrestrial and Yars’ Revenge, Howard Scott Warshaw (right), holding their copies of The Minds Behind the Games. Both were interviewed for this book. While there’s quite a bit of material in this book that will be familiar to longtime Retrovolve readers, there are some really interesting surprises as well. For example, I’ve often thought about the schlocky Sega CD horror game Night Trap in terms of its impact on the industry (alongside Mortal Kombat, Night Trap was a part of the Congressional hearings on video game violence, which resulted in the creation of the V.R.C. and ultimately the ESRB). However, I’d never considered the continuity nightmare the developers must have faced to get this thing to work properly. One chapter in The Minds Behind the Video Games lays it all out in a way that’s both interesting and entertaining. 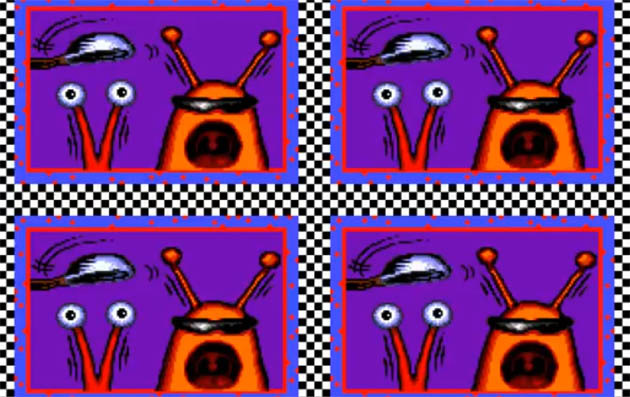 I’ve had the pleasure of speaking with ToeJam & Earl co-creator Greg Johnson, and I have a library of esoteric TJ&E knowledge stored in my brain, yet I was not aware that the funky duo’s origins can be traced back to a potential UFO sighting that happened on a camping trip that Johnson took at Yosemite with the series’ other co-creator Mark Voorsanger. There’s a chapter in this book that tells this particular tale. Obviously, retro gamers worth their salt are familiar with Yars’ Revenge for the Atari 2600, but how many can tell you about the excruciating playtesting the game endured, or that it unexpectedly tested very positively with adult females? Well, the ones who’ve read The Minds Behind the Games can. Rather than focusing exclusively on oft-asked-and-therefore-oft-answered questions, this book follows the meandering curiosity of the author, Patrick Hickey, Jr. That curiosity allows Hickey to explore some of the games that tend to get forgotten, like Desert Strike: Return to the Gulf, Voodoo Vince, and Gabriel Knight: Sins of the Fathers. It also means we get a peek into the world of mobile game development, looking at titles like Mushroom 11 and Squids. Hickey’s curiosity ultimately leads to the book’s most compelling chapter, which documents the development process of a game called Pro Wrestling X. This is a game that began as a dare on an Internet forum before it spent a decade running the brutal gauntlet of drama that comes with such an origin story. It’s the unrelenting perseverance of creator Dave Wishnowski that keeps the game alive through multiple tragedies — tragedies that would have shut down pretty much any other video game. It’s a crazy ride, and I’m definitely curious to learn more about Pro Wrestling X after having read about it. And speaking of facts, there are a few slip-ups that lead to some factual inaccuracies. For example, in the first chapter, Hickey claims that Mutant League Football is the only football game in which you can kill other players. Not true, as the oft-forgotten Jerry Glanville’s Pigskin Footbrawl offers a chance to murder the other team with “Concealed Weapons” you collect on the field. 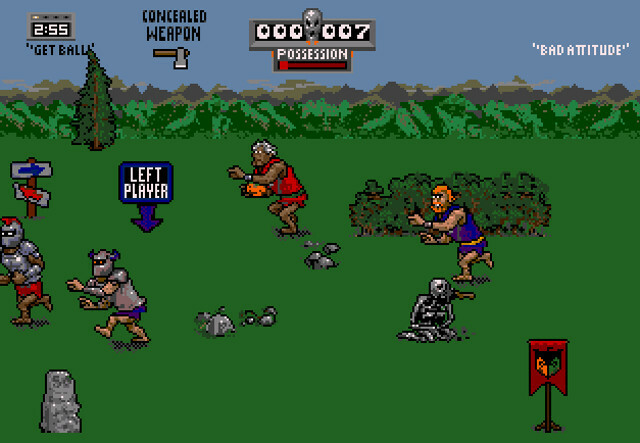 In fact, Pigskin Footbrawl was released at the tail end of 1992, so it predates Mutant League Football, which was released in 1993. Mutant League wasn’t even the first football game on the Genesis to allow players to kill opponents, let alone the only one. Oh, and there’s also Blood Bowl, released in 1995, but some might argue that it’s not really a football game (I’m inclined to disagree, personally, but there’s a compelling argument to be made there). Do these weaknesses ruin the experience? No. They tarnish it a bit, absolutely, but The Minds Behind the Games remains a fascinating book chock full of information you’re probably not going to get anywhere else. And that makes it a valuable addition to the collection of anyone who obsesses over video game history. A digital copy of this book was provided by the publisher for this review, but I’m considering buying a physical copy just to have it around. This is something I imagine I’ll be pulling off the shelf as a reference for years to come.